It's relatively easy to make Beetlejuice costumes, and the whole group can participate by dressing as one of the beloved characters from the movie. If you're searching for a unique group Halloween costume idea, why not consider dressing as the cast of Beetlejuice? Each costume is affordable and takes little more than clothing already found in your closet, along with a few creative modifications and face paint. Here's a look at the most popular Beetlejuice characters and a few good ideas to recreate their unique look. There were four main characters in the Beetlejuice movie; Adam Maitland, Barbara Maitland, Lydia Deetz and Beetlejuice. While there were several other supporting characters that helped make the Beetlejuice movie an entertaining Oscar-winning film, these costumed characters make the most impact. Go ahead and say it three times! Beetlejuice, Beetlejuice, Beetlejuice! 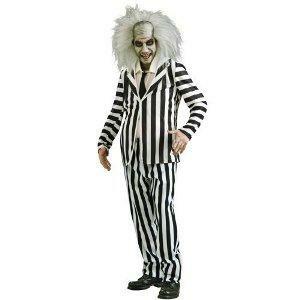 One of the most recognizable movie costumes has to be Beetlejuice, who was played by actor Michael Keaton. With his disheveled white hair and wide striped suit, this freelaning bio-exorcist makes a wonderful adult Halloween costume idea. To create Beetlejuice, you'll need three things- the hair, the suit, and the makeup. Hair: Beetlejuice had white, haphazard hair that stuck up in every which direction. If your hair is at least 5 inches long, you can probably recreate his hair without a wig by using gel and hairspray to lift and direct hair up and outwards. You'll then need to finish with a temporary white hair paint to capture his look. If you intend to buy a wig, shop early as the selection may be limited on white, long haired wigs. Make sure you rumple the wig and muss the style to create Beetlejuice's frazzled look. Suit: While you may be lucky enough to find a wide-striped black and white suit, you may need to rely on a few crafty measures to create this identifiable garment. For the easiest and quickest fix, tape sections of wide (at least 2 inch) white medical tape vertically onto a black suit. You can also use fabric paint to create the vertical lines, but tape will be much easier and will result in straighter lines. Once your suit is made, pair it with scuffed up black shoes. Makeup: To create Beetlejuice's pale, zombie-like features, you'll need to fully cover your face, neck and hands with white face paint. Once you've covered these areas, add thick black circles under your eyes and blend thoroughly. An inexpensive set of fake rotten teeth will help define your Beetlejuice costume. Lydia Deetz, played by actress Winona Ryder, dressed in traditional gothic black garb. To create her look, you'll need the clothing and the hair. Clothing: Most any type of black clothing will work for a Lydia costume. A long black skirt and a long sleeve shirt can be paired with tall black boots to create Lydia's troubled, teenage appearance. A black hat and veil covering your eyes is another classic Lydia style that can be made by attaching black tulle to a black skullcap if need be. As long as your outfit stays dark and mysterious, you're halfway there to creating Lydia's look. If you want a more intense costume, considering recreating Lydia and Beetlejuice's wedding scene where she wore a long formal red dress with a red tulle headpiece and red tulle or lace gloves. This costume idea is perfect for Cosplay enthusiasts. Hair: Lydia had medium length jet-black hair with bangs that was worn messy and spiky. A wig or temporary black hair paint can help you achieve her gothic hairstyle. In addition, you may want to whiten your face with either face paint or a light shade of foundation or powder to recreate her pale appearance. Adam and Barbara Maitland, played by both Alec Baldwin and Geena Davis are relatively easy costumes to create. For most of the movie, they wore the outfits they had on the day both were killed in a car crash. You can opt for their regular outfits, or recreate the wedding scene in which Barbara wore her white wedding gown and Adam wore a grey suit. Barbara: Barbara had long and curly brown hair that was pulled half up into a barrette. For her classic look, seek vintage stores for a cotton calico print dress and pair it with flat shoes. Adam: Adam wore a pair of glasses, tan chinos, a red t-shirt, and a black and white checkered long sleeve shirt that was buttoned nearly all the way up and tucked into his pants. The cast and characters from the Beetlejuice movie are sure to be recognized at any costume event or party. Not only is the idea affordable if you want to make Beetlejuice costumes, you can really get into the role and have some fun! If you want a creative and unique costume theme that is sure to thrill, why not consider dressing as this group of entertaining misfits?